Choosing a profession is the toughest stage in a person’s life, at first taking the line of education, then picking up a career and then making all efforts driven to the business is the total lifespan of a person. Have you ever seen a man doing nothing and still earning millions? Well that’s a dream and cannot come true. We are not born with a silver spoon in mouth neither we can rely on spoon-feeding so at the end of the day we have to pull up our socks and get ourselves going. When it comes to the artists, they apparently look subtle and mindful but inside them there is a stream that flows unstoppably—a stream of ideas, a preoccupation of their mind, some tasks’ pressure, some clients to be satisfied all this and all that. Designers are no less, they are the artist of passion and innovation. Because everyday demands something new out of them that is spot on, that is inspiring and that is impressive all the same. It is not only about sitting on the desk, watching the desktop screen, typing a few words, tossing mouse here and there to make a design, it takes something beyond and more than that. Behind every design there is a meaning, a story and a sense which describes it briefly and comprehensively. Now it is upon the hands and mind of the designer how does he carry his project out. 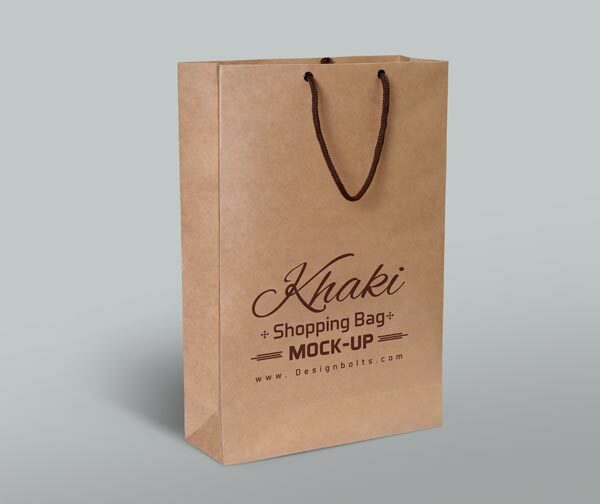 Today I made a free khaki shopping bag Mockup PSD that can be used for free to present a shopping bag design. Shopping bags should be reliable, harder that the luggage remains safe and doesn’t fall on the ground, the handles should be tighter enough so it may carry weight without a doubt. Hand carries are day to day need especially when we get to fetch stuff and goodies from the malls. If you are making a design of shopping bag you may use this mockup to showcase it to your client because you know, presentation is all that matters. Insert in your design and there you go. The approval will for sure come into your lap if you use this mockup for your shopping bag design depiction. Have a look. Do let us know what more are you eyeballing at!